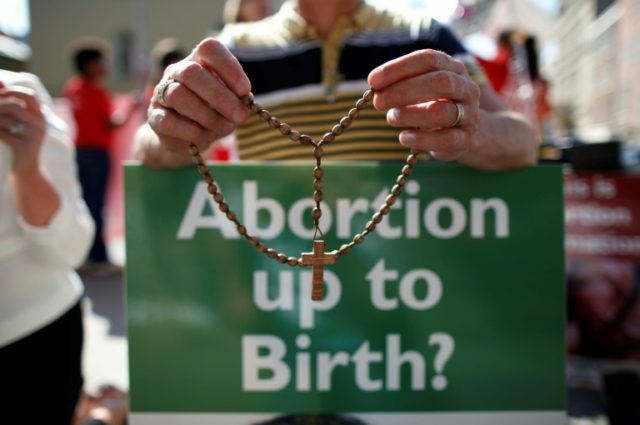 Dublin (AFP) – Ireland announced it will hold a referendum next year on whether to repeal its constitutional ban on abortion in almost all cases — just a few weeks before Pope Francis visits. The government is also planning votes to remove Ireland’s anti-blasphemy law and to reduce the time couples must spend apart before divorcing. Prime Minister Leo Varadkar has previously said the eighth amendment of the constitution, which makes abortion illegal unless there is a real and substantial risk to the life of the mother, was “too restrictive”. His government has decided Tuesday that a referendum — which must be agreed by parliament — should take place in May or June 2018, just before the pope visits in August to attend the World Meeting of Families. Abortion has always been illegal in Ireland but was inserted into the constitution in 1983 following a referendum, in which 67 percent of voters were in favour and 33 percent against. The eighth amendment recognises the equal right to life of the unborn child and the mother — and a woman convicted of having an illegal termination faces 14 years in prison. Opinion polls in recent years have consistently indicated strong support for reform in Ireland, which remains largely Catholic but where scandals have dented the church’s authority. “We need access to free, safe and legal abortion for all who need or want it. And we need it now,” organisers said. The Abortion Rights Campaign said it “cautiously” welcomed the announcement. “It depends on the wording of the referendum,” spokeswoman Linda Kavanagh told AFP, fearing that it could be watered down from broad access to abortion. The Irish constitution can only be amended by referendum, and in 2015 it became the first country to legalise gay marriage that way. The government set out a timetable Tuesday for several votes over the next two years, including on reducing the time couples must wait before a divorce from four to two years. In October 2018, it proposes a referendum on the constitutional amendment which makes illegal the “publication or utterance of blasphemous, seditious or indecent matter”. At the same time, it proposes a vote to repeal or change a section relating to a woman’s duties in the home, perhaps to make it gender neutral and to include other caring responsibilities. “Any amendment to our constitution requires careful consideration by the people,” Varadkar said in a statement. “They should be given ample time to consider the issues and to take part in well-informed public debate,” he said.